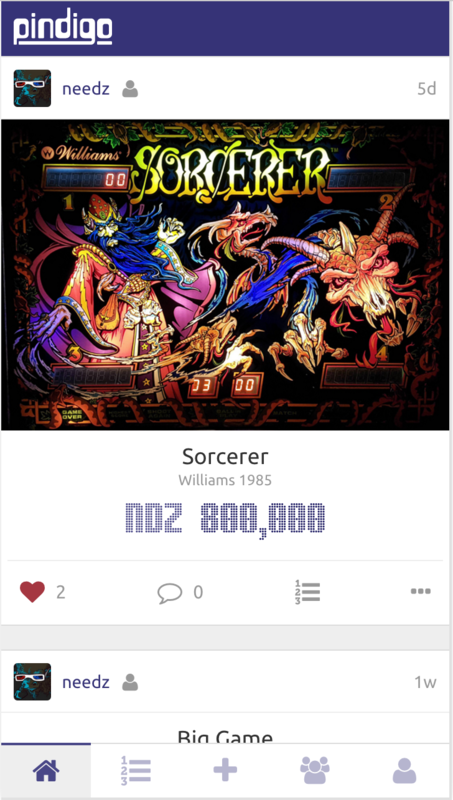 » Forum » All Pinball » Pindigo: score tracking app — V3 out now! 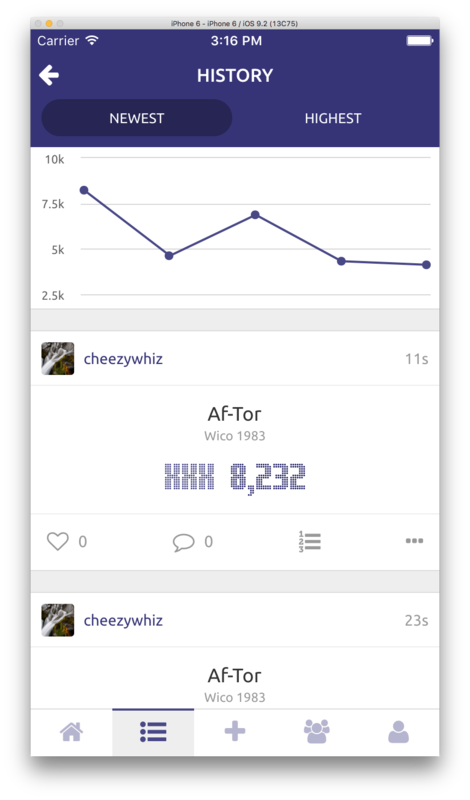 » Pindigo: score tracking app — V3 out now! Pindigo: score tracking app — V3 out now! There are 451 posts in this topic. You are on page 7 of 10.
can't find Waterworld on the app. Search for rw and Waterworld comes up. That search feature is WEIRD. Try finding Hercules, lol. Devs, any word on a search feature fix? Star Trek bug is still there. We're wrapping up our work on v2 and will start beta testing soon. The app has been rebuilt from the ground up and searching works great. There have been some delays due to a new job, a new baby, an old mother-in-law, and a cat that chews power cables. Beta should kick off as soon as we squash the last few bugs. I'm hard at work today! We just have so many great ideas for this app and we want to make sure it keeps you coming back for more! Score reporting? We got that. Social ranking system? We got that. Facebook logins? We got that. Links to pintips, pinballvids, ipdb, and pinside? We got that!! To all those that have messaged us for access to the beta, IT IS COMING SOON!!! I downloaded this app.. I have no friends .. how can I use this app? It just seems so empty to me. What am I missing? Version 1 is in a deprecated state (no longer maintained). Cheezywhiz and myself have been developing v2 for roughly 6 months now and it will be very easy to add all of your friends, whether they're on pinside or not. 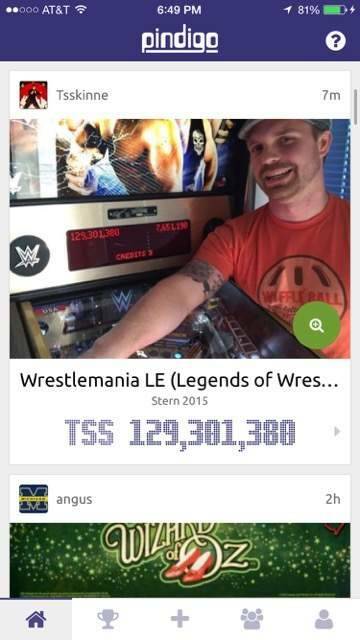 It also has comments, likes, metrics, and links to third-party pinball services. Feel free to send Cheezywhiz or myself a message if you'd like access to the closed beta. On the home screen, you can switch the view to show 'global scores' so you can browse everyone's posts. You can also search for users from this thread and follow them. I use it to track my scores. I envision being able to see a list of games I haven't entered a score for yet, clicking a game on the list and seeing where to play that game on location. Cross reference / pull data from Pinball Map? Could be useful for selfie leagues, either mail photo to X or post to X. Also need ad/sponsor functionality so you can sell advertising to local arcades and pinball related businesses. I took a lot of notes from this post, haha. ALSO, just so everyone knows the beta is now in full effect! Message me or cheezywhiz for details! new version out on iOS - no longer says "powered by Pinside" and my login is not working - Does it require a separate login now? just downloaded the new version and its very slick! great job! Does it require a separate login now? Yeah. The app is no longer just a front-end for Pinside scores. It's a whole new score system. We had to make the change so we could continue enhancing features and improving the app performance. Is there a way to go back to the previous version 1.0.5? I don't like the new version because there is no connection to Pinside. All my scores are invisible right now. A future feature to interface with Pinside is not going to help me now. So, if possible I want to go back to the previous version. I'm on iOS 9. Unfortunately from iOS 9, downloaded apps get no longer synchronised between iPhone and computer, so I don't have a previous version stored in my iTunes (otherwise I would have reinstalled using the previous .IPA file). In the meantime, there are various ways we can improve the situation for our v1 users, so please help me understand what bugs you the most. Is it that you won't see your new Pindigo v2 scores on Pinside? Or that you can't see your old posted scores in the app? Let's take the IPA discussion to PMs and I'll see if I can get you fixed up. I'm leaving for ReplayFX in a few hours - all you wonderful Pindigo users, I'd love it if you favorited me so I can show off my weak scores on hundreds of pins! I didn't realize the app got updated! I'm a little confused about the log in process, though. If I use my Cornelius login info, I get a message saying "this user hasn't set up a password". If I try to make a new account, I'm told that "Cornelius" is already in use. Is Cornelius gone forever? 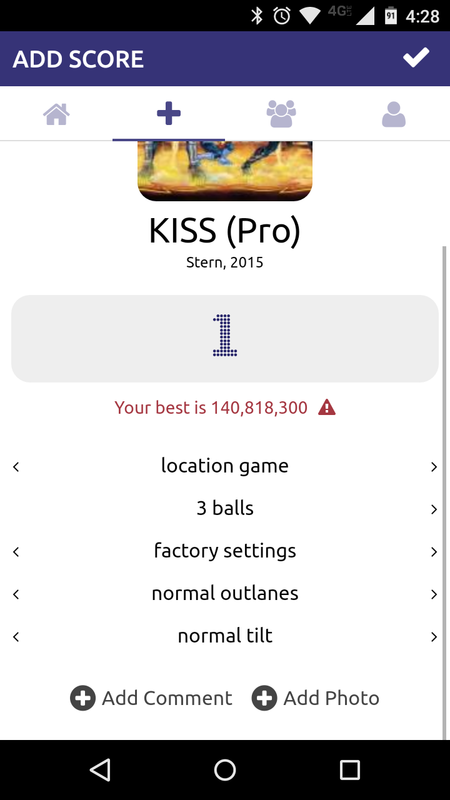 Cornelius, the app will not show scores you have saved in previous versions. For now you'll need to use the Pinside website to see old scores and if you want new ones entered in Pinside. 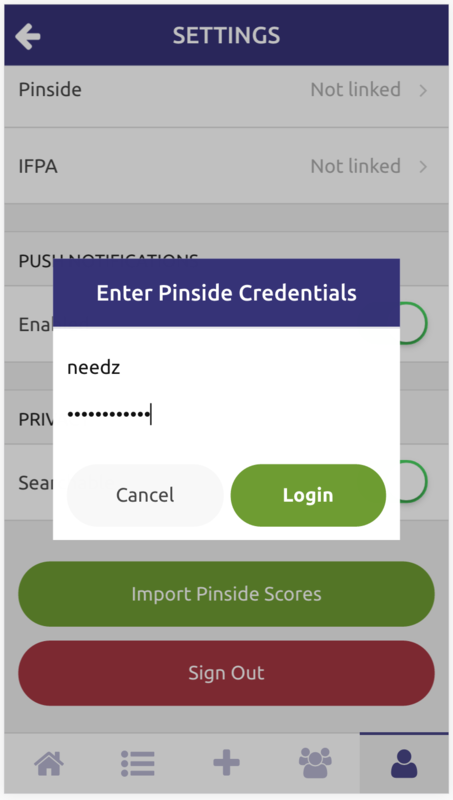 The app will save new scores but Pinsiders won't see them. Log in the same way you did for the beta. You probably used Facebook, no? A huge plus with Pindigo from my perspective was syncing with Pinside. There's a big community of scores to compare yourself against, hard to replicate that with a new platform. Hopefully syncing will be restored at some point, with whatever changes that takes from Pinside and/or Pindigo! Any way to import scores (CSV, text, xml)? I've got stuff on Pinside that I'd like to import but not a big deal. I've got other scores in a spreadsheet that I didn't put into either system. I know others that track via spreadsheet, too. Nope. Cornelius as the user name. I try to log in using my credentials that I used to log in the previous build, and I get a "user does not have a password set up"-esque message. Try logging with only my username and I get "access denied". Try making another account, "Cornelius is already in use". I just logged my old scores and some that wouldn't take with the old version. Everything worked great. A couple small suggestions..
Is there any way to allow photos from more than the listed sources? I tossed my hi score photos on Dropbox and couldn't access Dropbox from Pindigo. Also, it is possible to make it go to the last location as a default rather than clicking through folders? Great job overall. I tagged my Pintastic scores (most of them). Looking forward to having this at the next show. Yes and yes. I have hundreds of scores in Pinside so I'm not going to copy those to Pindigo and the nice part of Pindigo was the easy interface to add scores (while also seeing the previous high on a machine). I can understand your reasons for not being able to sync right now, so I'll keep an eye out here for its (hopeful) return. I hear ya. 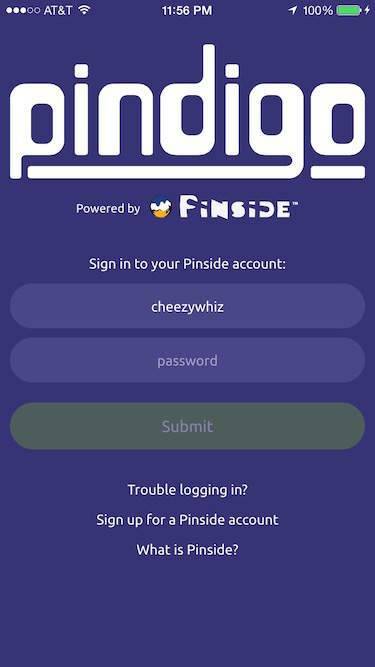 We'd love to keep Pinsiders using the app, and we'd love to continue generating scores for Pinside. We will get it worked out. Thanks everyone for being patient and helpful! Hey everyone. I'm gonna see what I can do about at least allowing you to import your scores from Pinside to Pindigo while we wait for more official support for synchronizing. Check back in here later on Sunday for more news about that. I hear you loud and clear and I'm going to do what I can. Cornelius. I see your problem there and I will send you a message in a second so that we can get that figured out. Very sorry for the inconvenience. I will look into that request. The plugin I use is supposed to defer to your system to select a photo, but I'll see if theres anything I can do for that. I think worst case scenario is you have to export the photo from dropbox to your phone's internal storage, and then select the image from there. Maybe the only reason it would matter is for manually adding old scores. If you got a Pinside transfer working it wouldn't matter. I wonder if you could monetize by incorporating selfie leagues for locations? Can you think of a way this might work with Payrange, the cashless payment system Tony from the Coinbox podcast likes so much? Maybe a city wide selfie league where Pindigo shows the current scores on the machine you're at and incorporates a mapping function to get you to the next pin in the league. The virtual league is a cool idea. I think the location thing has some possibilities. I'd love to see all the scores on a specific game at a show or a certain location. We are currently in talks with pinballmaps to see if we can communicate with their service to read/create/update locations across both systems. I'm testing Pinside score imports today. 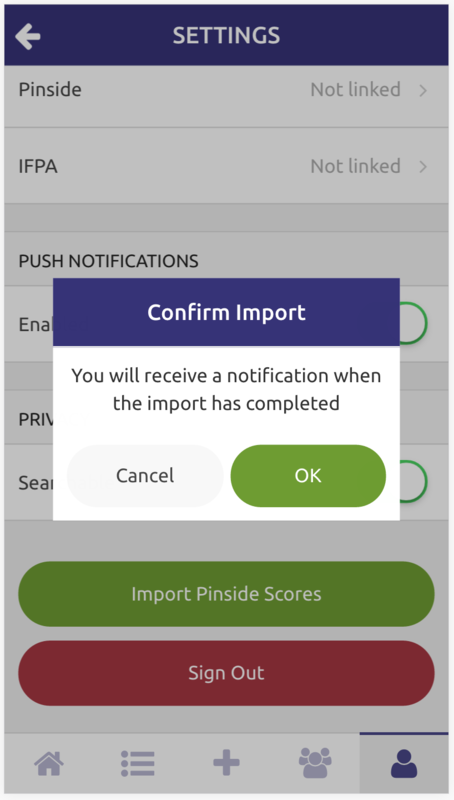 When this update hits, you will only be able to import your Pinside scores ONCE. This is just for now until official Pinside support is a thing. The import functionality is complete, but we're going to wait until our Pinburgh contest is over with before rolling out that feature. Stay tuned. Just started messing with this today. One suggestion right off the bat: it would be cool if when you hit the plus to add a new score, if the search screen came up with the last 3 or 4 games you put scores in as shortcuts. I know you can go to the entered list and swipe to get a quick add, but this other thing would be cool too. Just a heads up: I added this feature in today. It'll be in the next release. Still testing pinside imports. It's important to get it right. Pinside score imports are now a thing! 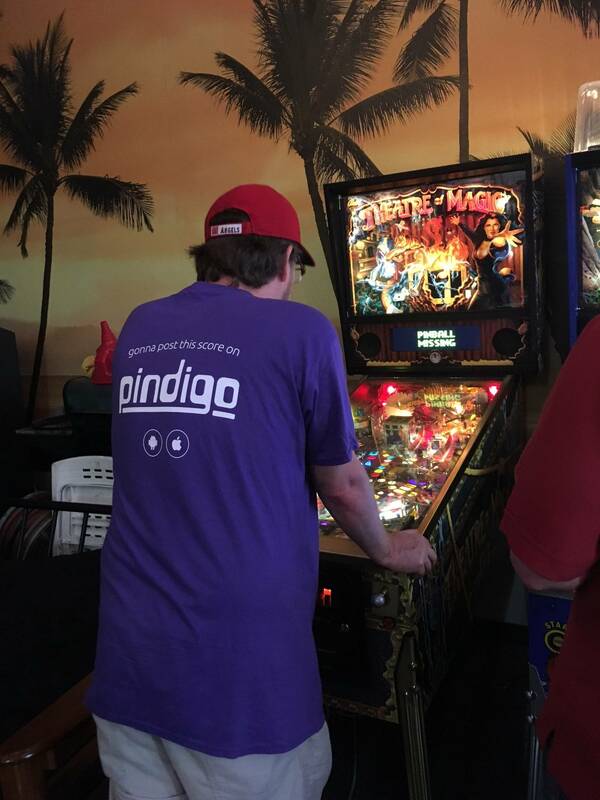 I won a Pindigo t-shirt and proudly rocked it at Pinball Land! Thanks Cheezywhiz!! I love the app and use it regularly. A few suggestions if I may? I drew a quick sketch to help me illustrate what I am talking about. I would love for a date option and location to be available. Click on the date button to default to that day, click again to bring up the calendar. Don't click on the date and it won't save anything so if someone did not care about it they don't have to use it. Location - click on it to type in a location the score was set at or select from recently used locations. 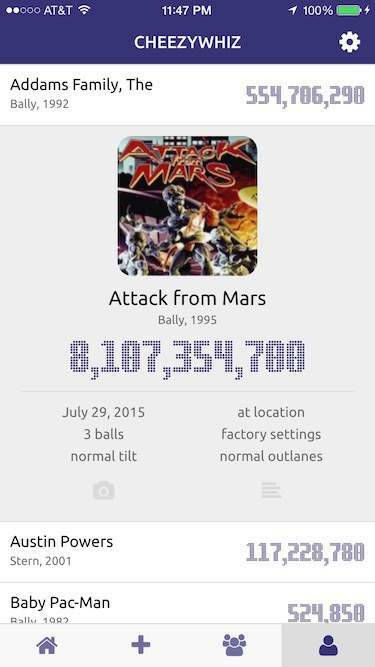 I travel around playing machines and always log where I played a certain machine. This also helps when I want to play the table again as I know where it is. Maybe in settings you can set three or four regular locations for the drop down and any typed entries don't appear after the end of day? I would LOVE to compare scores with people on my social circle. My wife and I are very competitive and it would be great to select a table and see the high scores for that table in one spot. Or select another player and compare tables that you both have entered scores for? Speaking of scores, can I assume that when you import scores from Pinside that the scores you entered in the app do not transfer back? 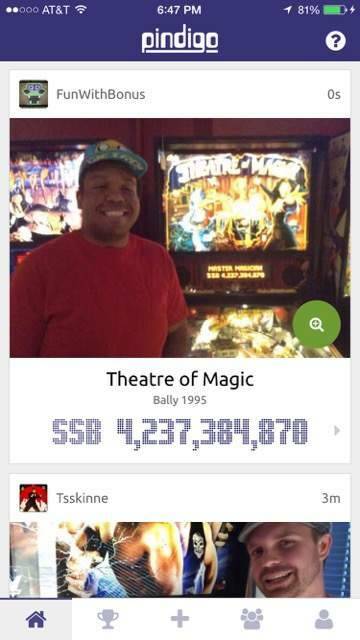 So if I use the app for a night of pinball I still need to go to Pinside and enter them manually? Love the app and use it ever time I play. I am on a quest to play 200 different pinball games in 200 days and this has been a HUGE help for me. Thanks for all the time and effort you guys have put into it. Hey Matt, thanks for the suggestions and kind words. The sketch helps a lot. Location support is coming. We plan on using pinballmap.com's api to let users tag locations (and eventually prompt them to create a location if one doesn't exist yet). I'm guessing the date field would be to retroactively add scores? I'm not sure how I feel about that, especially since the score-feed is in chronological order, but if enough people wanted something like that I guess we could work something out. I like the compare scores idea. I think it would be great if the profile screen had a button that let you compare scores with that user. Sounds like some pretty low-hanging fruit to me. I might work on that this weekend. You're right, Pinside import is one-way right now. I'm waiting for more official support for prolonged authentication from Pinside before I feel comfortable doing much else. I guess I figured the date and location would be just for the end user and not sent anywhere. I know my wife takes pictures of her scores and uploads the highest one for each table the following day so that was more my thinking. Is there a way to display the date the score was submitted?Say for example I am scrolling through my scores and I come across one that I have been trying to beat for a while, is it possible to see the date I set the score to see how long I have been trying? Or if I am browsing the charts and see the #1 score, can I see how long that score has been there? You could actually have some fun with the compare scores. 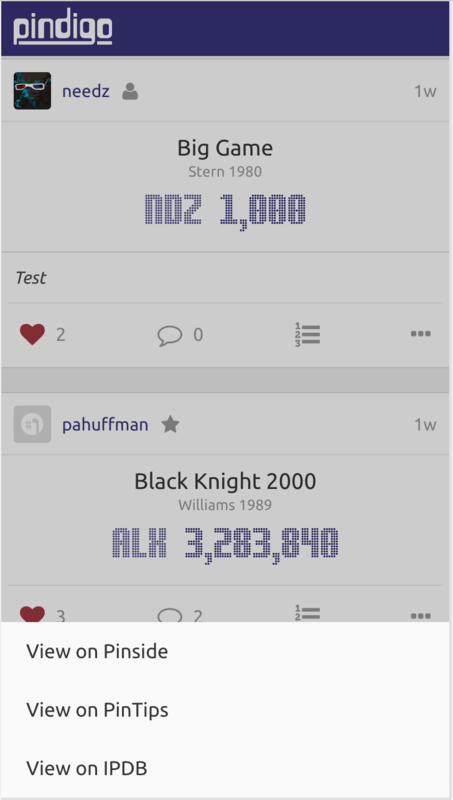 Say you go into the social part of the app and click a "Fun stats" button you could show a ranking of friends based on various metrics like "Most tables played", "Most scores submitted in last 30 days", "Lowest Ranking on a table" and so on. That may be a silly idea but I am spitballing here. Where most of these ideas are coming from is from using the app with my wife. We would love to be able to have more "interaction" with each other to see how we are doing and compare scores and such. We just do the high scores so we don't spam the Global scoreboard all night. What I do is open Pindigo, check the score I am trying to beat (my own or the wifes) and then play. If I have bad games I do not bother to log it but if I beat the score then its photo and logging time! My wife just takes the photo and sorts through them all later, of course this could also be why she runs out of tokens before me, lol. 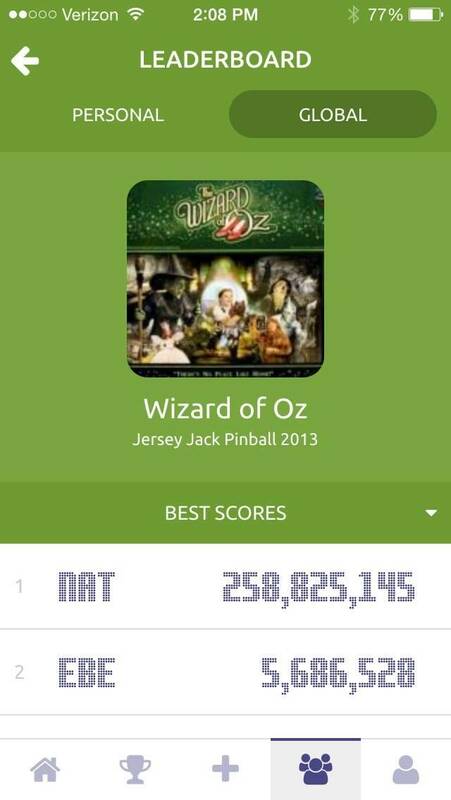 We just do the high scores so we don't spam the Global scoreboard all night. Maybe the app should only post to the 'global' list if you beat your previous best score on a game. That would cut down on chatter from the way I'm using it. We haven't decided between 'private scores' which wouldn't show up in global and are manually set versus doing something like what you mentioned or some sort of fancy 'denoise-ification' (copyright pending, ) that would group together scores by a user for the same machine within X amount of time. I LOVE this idea! You win the Internet today! Maybe one day we could have badges/achievements and this would be one. 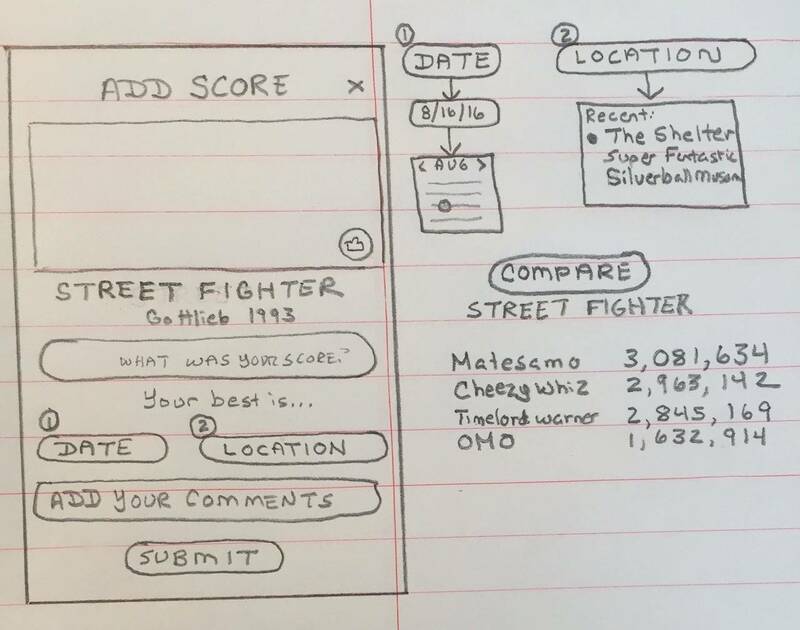 Compare scores is definitely something we can tackle soon. Location tagging, too. We're on it.